A RUMOUR steals through the building like a draught under doors. The draught becomes a chill wind, whispering along corridors and through unhappy offices. 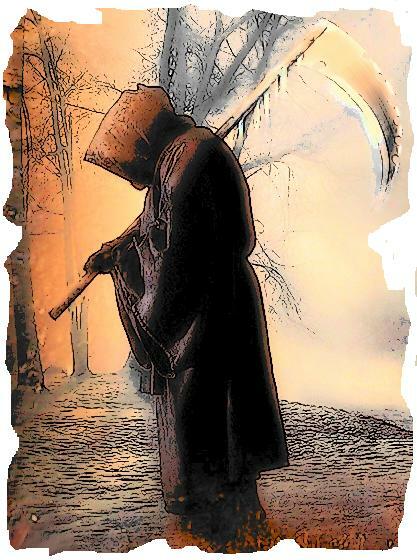 And the rumour says: The reaper is returning with his scythe on his shoulder to claim yet more souls in this week before Christmas. He will slice and chop grown men and women at the knees, leaving them to bleed their loyalty on the carpet tiles. And as he passes he will scatter dismay, anger and P45s. I climb to the roof after the first edition has been sent across the country to its distant press. The rumour has been substantiated. It is a rumour no longer – it is as much a fact as I am standing here beneath the night sky and you are sitting there reading my words. All the computer technicians have received notices of redundancy – in this week before Christmas. Their department is being “restructured”. At the end of this “restructuring” process there will be fewer jobs. They have been invited to apply for them, knowing that not all will be successful. That’s how it works these days. I know. I’ve been through it twice in recent months. I have been observing “restructuring” processes for the past four years. Below management level they inevitably result in fewer jobs. At management level they seldom result in fewer jobs but sometimes create more. I intend to contact the Oxford English Dictionary and petition for a new definition of the verb “to restructure”. Restructure V (tr) 1. to organise (a system, business, society, etc.) in a different way; 2. To sack loyal workers who have created the wealth and are largely responsible for the success of the company and increase a top-heavy management layer with non-productive, puffy-palmed smug pillocks on large salaries whose purpose is to bring about further restructuring. On the parapet, between the obsolete air-conditioning filters, I stand and gaze out across December skies. Christmas lights twinkle in Nitherley’s streets. The rumble of a goods train drifts from the distant railway. An owl hoots in the churchyard behind the office. At times like these, when the scythe of redundancy swoops, I used to get angry and frightened. Now I despair at the abject futility of it all. My idea of a successful company is one that grows its profits by innovation, production, imagination and development – using talent, ability and expertise with a dash of flair and an element of risk. This is a company that, in order to satisfy the expectations of its shareholders, increases its not-too-meagre profits by 1) sacking people and sending their jobs to India; 2) sacking people and re-employing them part-time on lower rates; 3) sacking people. Down the road into the sunset stumbles an unsteady line of hard-working, dedicated, faultless, multi-skilled, productive and passionate people who care about their work but have had their feet sliced from under them. This is the recent past and this is the future. This is the brave new world of the Big Society and the all-powerful private sector. This is what we are expected to embrace and uphold. Meanwhile, the product market shrinks ever smaller and quality is sacrificed. And in an industry that is swiftly evolving from print into digital media – and is becoming increasingly more reliant on technology – they sack the technicians. Can’t get my head around that one.